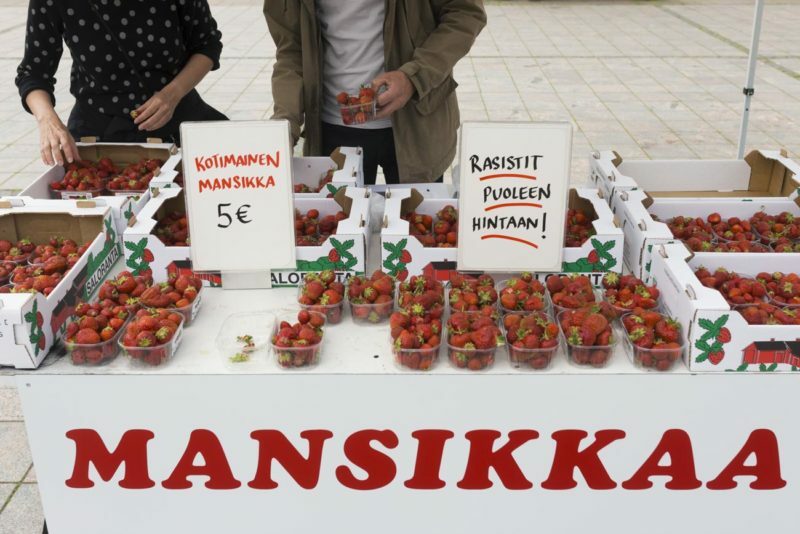 The intervention took place at the market square of Riihimäki, a small town in southern Finland. It was the first day of July: the beginning of summer holidays and the long-awaited strawberry season. One of the stalls at the market had domestic strawberries for sale. They were sold for the usual 5€ for a small crate, except that racists would get them for half-price. To get the discount, one only needed to say ”I am a racist” and shortly explain how. One could also just pretend to be a racist and still get the discount – after all it was up to the customers to define themselves racist or not. There was no doubt or judgment from behalf of the sales personnel. The strawberries were selling pretty well during the day. Around 15 of the 50 plus customers had them for half price. Someone proudly declared to be a racist, while another was buying for a racist waiting at home. One customer explained that her dog is a racist. Some were wrestling against the temptation to fall into the rather tempting price offer, still managing to keep their calm and pay the full price.